A few weeks ago I had a party at my house. And not just any party, a special one. 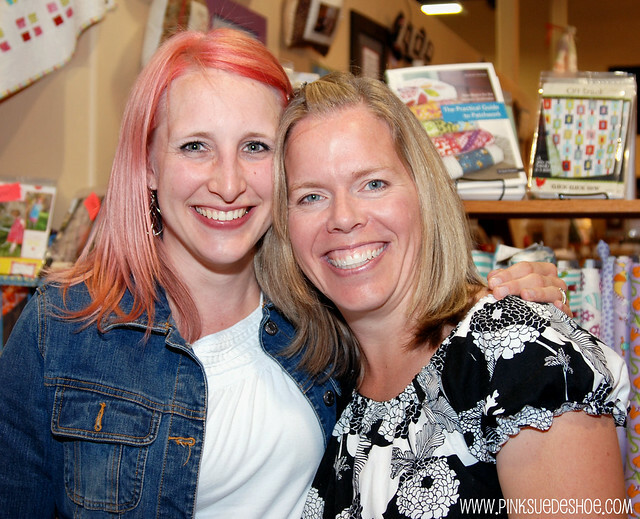 My friend Amy was in Utah visiting her family earlier this month, and while she was here I offered to host a party for her so she could meet all her online Utah friends in real life. 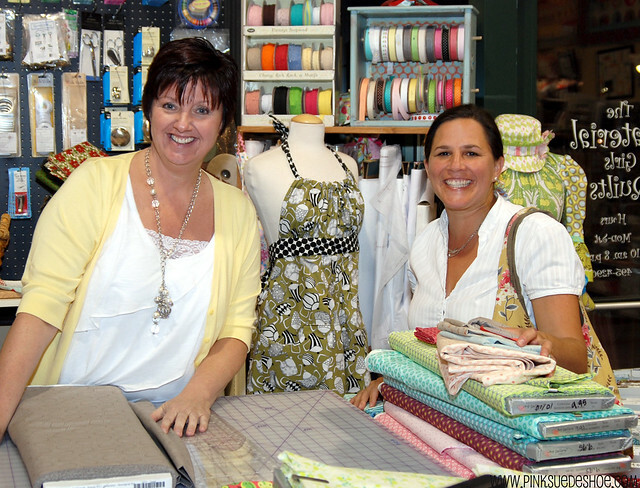 For a while now she has had a weekly (now it’s a monthly) feature on her blog called Sew & Tell. It’s basically a link up party but with friends who will give up advice on the middle of your project, or congratulate you on finally finishing that really old project that has been kicking around your house forever. And while she was here we decided to have a live version of Sew & Tell. It was so much fun, and it made me realize how wonderful the internet is for bringing like minded people together. 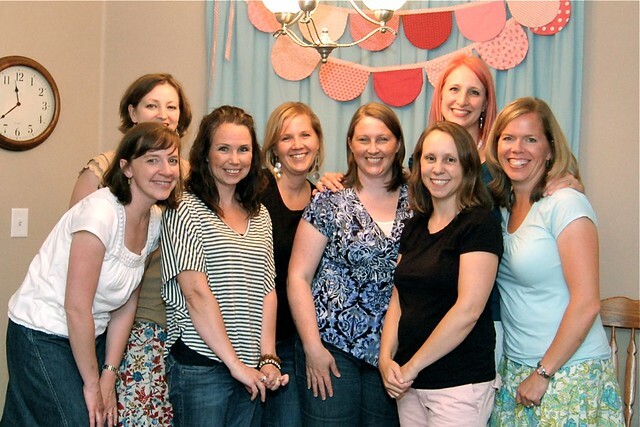 From left to right we are Amy, Diary of a Quilter, Amy, Vintage Fern, Erin, Two More Seconds, Leigh, Leedle Deedle, Elizabeth, Such a Sew and Sew, Vicki, Sew Inspired, me and Amy, amylouwho. Thanks amylouwho for taking pictures! We all brought a sewing project we had been working on, or just finished and we had plenty of good food and great conversation and had a great night together. A few of Amy’s friends weren’t able to make it (there was a giant rain storm that day!) and so a few days later we did it again. 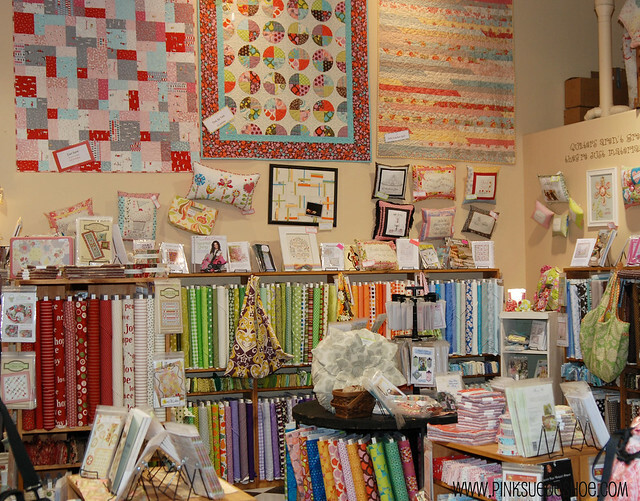 But this time we met at The Material Girls quilt shop in South Jordan, which is owned by the wonderful Nadine. 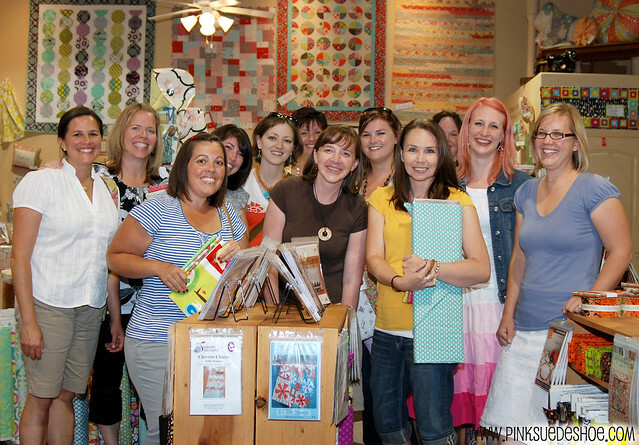 From left to right: Calli, Make it Do, Amy, Amylouwho, Sara, Sew Sara, Vanessa, V & Co. Amy, Vintage Fern, Nadine, Material Girls, Amy, Diary of a Quilter, Megan, Quilt Story, Erin, Two More Seconds, Shari (hiding in the back), Doohikey Designs, me and Leigh, Leedle Deedle. We had dinner together and spent the evening looking at fabric, chatting, laughing and while we sat around the work tables in the back room. It was another wonderful way to spend the night. I don’t think I got home until well after midnight! 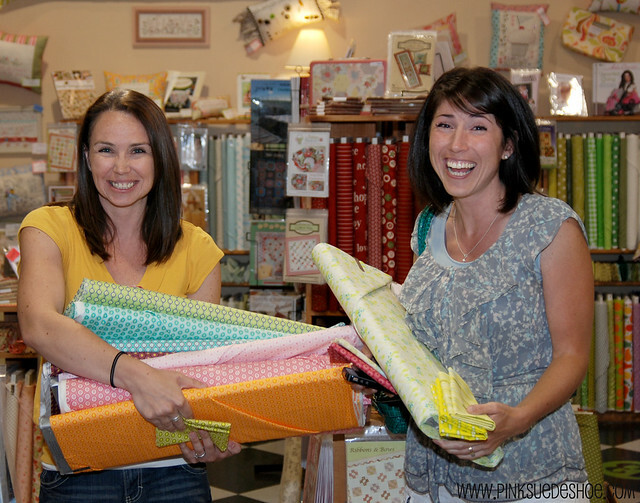 Erin (Two More Seconds) and Vanessa (V & Co.) picking out fabric. Nadine has amazing taste in fabric, not to mention she orders everything. We all came home with a little something new! This is just one wall of her not very big, but absolutely packed store. And thanks to Amylouwho for showing me how to use her flash. I bought an off camera flash for Scott years ago (he knows WAY more about photography than I do!) and since she showed me how to use hers I haven’t been so afraid to use ours. Thanks Nadine for keeping the shop open late just for us. I had such a great time listening to stories and laughing with everyone. It made me realize that I need to get together in real life with people who share my interests a lot more often. These women felt like old friends. And I don’t know a single person that doesn’t need more old friends. And thanks Amy for coming to Utah to give the rest of us a good excuse to get together. I spent a few more nights hanging out with Amy, and I can’t wait for next summer to hang out again. And as for the rest of the amazingly talented women I had the privelege of hanging out with… lets do it again. Soon. ha. as i read this, i am sewing! love you, talented lady. have an awesome week. what day would be good to come over and use the 1 inch round Cricket. FUN FUN FUN!!! I obviously have to come to Utah to swim in a collapsed crater and shop with you! Oh, and possibly eat strawberry shortcake with Oreos on the side. It was so much fun, and I agree, we should do it again soon. So much fun! You’re such a great friend, Erika! post is written through him as no one else recognise such targeted about my problem.